What’s in Your EBSD Pattern? When collecting EBSD data it is important to optimize the detector/camera to obtain the desired information which is usually focused on crystal orientation. However, many factors affect the creation of an EBSD pattern beyond orientation. Some of these are demonstrated in Figure 1. In this blog post we will examine some of those factors. In doing so we will also take advantage of PRIAS imaging to illustrate a few of the different effects. Figure 1: Examples of EBSD patterns collected under varied conditions. The pattern on the left represents the ideal pattern, while the one in the middle is a mixed pattern and the pattern on the right is an unprocessed image. A list of a few of the most important factors that affect EBSD patterns is given here. The author recognizes that all effects may not be accounted for and invites your additions in the comments section of this blog. Not only do the listed factors affect entire EBSD patterns, but some manifest more apparently in certain regions of the image. This is often best manifested in geological samples containing topography, atomic differences, and orientation contrast (see Figure 2). Figure 2: (Left) PRIAS image taken from the top of the EBSD detector, showing surface topography; (middle) PRIAS image taken from the center for the detector, showing orientation contrast; (right) PRIAS image taken from the bottom of the detector, showing some atomic difference. Some of the factors that affect EBSD patterns are apparent enough that they can be seen by eye; others are so subtle that they require more sensitive techniques. The final example that will be shown in this post is of magnetic domains. The effect of magnetic domains is not visible by just looking at the EBSD patterns, however, PRIAS imaging makes this effect visible. For this example we will look at a grain oriented electrical steel. Figure 3 shows distinct magnetic regions especially when compared to the SEM image. 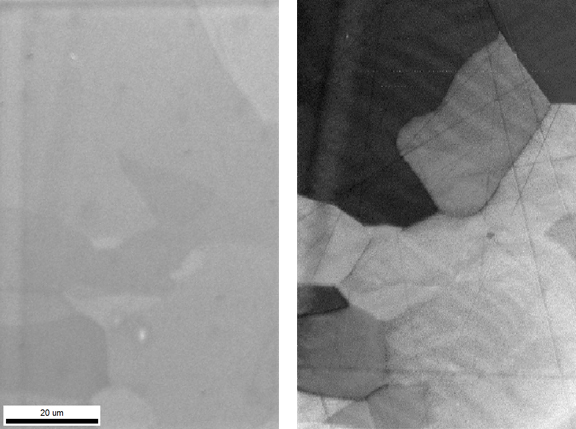 Figure 3: (left) SEM image taken of steel and (right) PRIAS image taken from the left side of the detector showing magnetic domains. The images in Figure 3 give one view of the magnetic domains. An additional set of views is seen in the full 5 x 5 array of PRIAS images shown in Figure 4. A close inspection of all 25 images reveals several varying structures. The differences between all of the ROIs is not fully understood at this time and is the subject of an ongoing study. 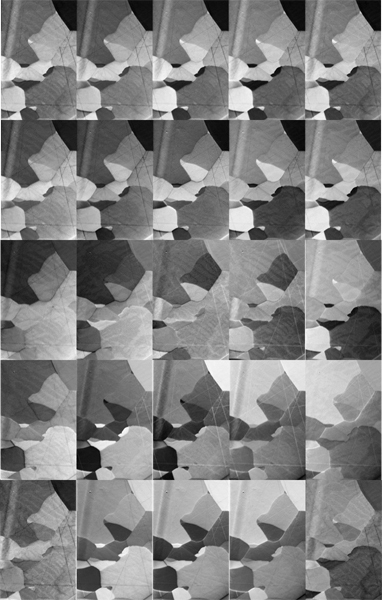 Figure 4: 5 x 5 grid of PRIAS images taken from grain oriented electrical steel. Each ROI image shows different structure. These examples represent just a few of the factors that affect the formation of an EBSD pattern. Often these effects can be seen in the patterns alone, but other times PRIAS imaging is required for clear visualization. While EBSD is a reliable method for measuring crystallographic orientation and phase information there is often much more information in the EBSD pattern. So I pose the question, what’s in your EBSD pattern? The first interpretation of the question is not as easy as one might think. Unlike the detector resolution, which is a fixed value regardless of your sample or microscope settings, the MDL is heavily dependent on the microscope settings, the sample composition, the detector resolution and last but definitely not least, the number of counts in the spectrum. At the end of the day, the MDL comes down to whether we can reliably say that there is a peak at the energy of a certain element. The method to establish whether a peak is present is typically borrowed from the world of microprobes, where we simply look at the number of counts on the peak centroid and the number of background counts. If the number of peak counts is above the background by some level (often 3 standard deviations) we say the element is above the detectable limit. This means that we need a high degree of precision in our results to drive the noise levels down, which means that the number of counts come into play; essentially, the longer the acquisition time is, the lower the MDL will be with all other parameters being the same. And since both background and peak counts are affected by the microscope parameters and the composition of the sample, one MDL measured on one sample would not be applicable to another sample unless the composition of the two were very close and the same microscope parameters were used. This also means that the MDL will differ significantly depending on which X-ray lines are used. If we consider the Pyrite (FeS2) spectra shown below for the range of the Fe K-lines and L-lines and simply use the counts the highest channel and the corresponding background fit value, the peak to background ratios are 37 and 18 for the high energy and low energy peak respectively. While this approach is a little simplified, this basically means that the MDL when using the high energy peak is half of that for the low energy peak, simply due to the difference in peak to background ratio. And of course if the processing time is changed, the detector resolution will change and consequently the peak will become broader or more narrow, which will change the counts on the highest channel. The lesson to be learned here is, that when we are reluctant to answer this aspect of the “how low can you go?” question, it’s not because we are trying to hide something, it’s simply because we would need to know the composition of the sample, the microscope parameters used, the X-ray line of interest, and the statistics/number of counts in the spectrum, before we can even start to do the math or give you an educated guess. And it should also be taken into account that the answer that comes out of the calculations will only be applicable to that specific sample and not a universal limit. The other aspect of “how low can you go?” really comes down to the resolving power of X-ray maps. We can easily increase the size of the maps we acquire to say 4096×3200 pixels, but if the area/volume we get information from is larger than the single pixel size, this doesn’t really give us any additional information. The interaction volume can be modeled in various ways, but since an image is worth a thousand words, I had been thinking about a good sample to illustrate this for a while. Luckily I was at Pittcon in New Orleans this March, and thanks to John Yorston from Zeiss, I learned that flicking a lighter and letting the sparks hit a stub with carbon tape will allow you to pick up particles rich in O, Mg, Fe, La, and Ce with a size distribution from tens of µm down to about 100 nm. Shortly after getting back into the lab, I “borrowed” an empty lighter from our Software Manager Divyesh Patel, and popped the resulting sample in our FEI Nova Nanolab 200. The resulting SEM image acquired at 10 kV can be seen below. 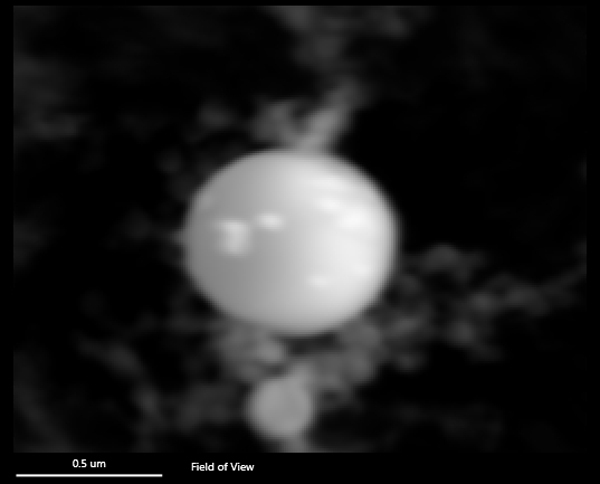 The largest particle in the center of the image is roughly 700 nm in diameter while the slightly smaller particle below it is about 300 nm and the small particles scattered around are on the order of 100 nm. While these particles can easily be seen in the SEM image, there is typically a world of difference between the interaction volume of secondary electrons and X-ray photons, so what would an X-ray image look like? In the TEAM™ software we also build up an image based on the X-ray counts per second (CPS) in each pixel when we are mapping the sample. The CPS image of the same region as the SEM image can be seen below, and one can immediately see that they are quite similar. 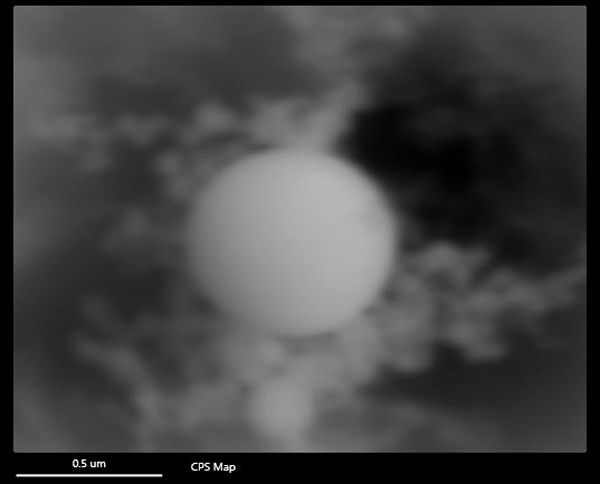 Some shadowing can be seen to the right of the large particle where X-rays are being blocked and a few features are slightly more blurry in the CPS image, but the CPS image also shows us features that were not visible in the SEM image (compare the top left corner in the two images) and clearly resolve the 100 nm particles. So does this mean that the resolution of the X-ray maps are comparable to the SEM image? Well, yes and no. The secondary electrons that we use for the SEM image are typically defined as anything with an energy below 50 eV, which means that they can only escape from a region very close to the surface. X-rays on the other hand can travel through a significant distance of material, depending on the composition and photon energy. Shown below are two simulations (created using the CASINO software) of the energy deposited in the sample with a 100 nm layer of either CeLa or Mg on top of a carbon substrate. Two simulations of the energy deposited in the sample with a 100 nm layer of either CeLa or Mg on top of a carbon substrate. The simulations show that for the CeLa layer, the energy is pretty much confined to the layer/particle, while we get a significant penetration into the substrate if the layer is made of Mg. The data showed that the large center particle was primarily La and Ce while the smaller particles around it were mostly Fe and Mg (La and Ce maps shown below). So while we seemingly have quite good resolution in the CPS image, the depth from which we get information can vary dramatically with the composition of the particles. Again we end up with the problem that there’s no simple answer to this aspect of the “How low can you go?” question. It depends on several parameters, including the composition of the feature of interest, but simulations can help us a long way towards understanding what is going on in the sample and give us an idea of what settings we should use for the data acquisition. While I have been somewhat non-committal in the details of the mapping resolution here, we will be discussing some of these topics in more detail in our upcoming webinar “Low Energy and High Spatial Resolution EDS Mapping”* on June 18, 2015 and look at what differences we see when changing the parameters. As for the MDL side of the discussion, this might be something for a future webinar as well, or come see us August 2-6 at M&M in Portland where at the very least we will have a poster covering part of this subject. *Registration for this webinar is now here.